Here are some tips designed to help postal customers have a happier, less-stressed holiday. The U.S. Postal Service plans all year for the holiday season. With more than 240 years of experience delivering the holidays, the Postal Service and local postal elves are ready to make this year the best one yet. Here are some tips designed to help postal customers have a happier, less-stressed holiday by getting those greeting cards and packages delivered on time and intact. Know the deadlines: Mail cards and packages on or before the dates listed. For military and international destination deadlines, please go to usps.com. • Sign up for free services and customize the delivery of their package by going to informeddelivery.com. • Receive text messages or e-mail alerts notifying them that a package is en route and additional notifications when the package has been delivered. • Request the package be held at the post office by choosing the Hold for Pickup option. • Redirect packages when they won’t be home to receive it by choosing the USPS Package Intercept option for an additional fee. • Ordering free Priority Mail and Priority Mail Express boxes and envelopes at usps.com/freeboxes, or picking them up from the local post office. 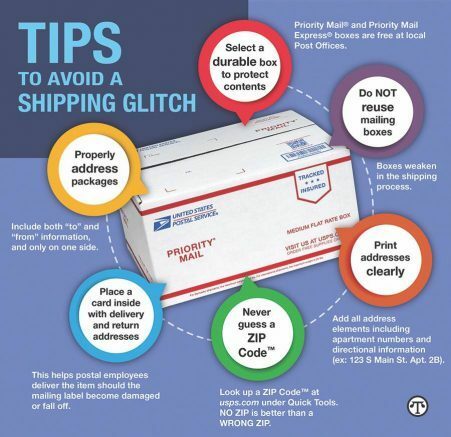 • Using Click-N-Ship online at usps.com/ship to create shipping labels with USPS Tracking and pay for postage — and by using flat-rate shipping products, weighing isn’t necessary. • Getting packages picked up for free at home or in the office with Package Pickup. Just hand the package to the mail carrier on his or her regular delivery route. Pickups can also be scheduled at usps.com/pickup. All of this information and more can be found at usps.com/holidaynews. Be the first to comment on "Postal Service tips for a less-stressed holiday"